On August 5, more than 3,000,000 gallons of acidic, heavy-metal-laden mine waste from the Gold King Mine polluted the Animas River in southwestern Colorado. Ironically, the accident occurred while contractors for the U.S. Environmental Protection Agency (EPA) were trying to plug a smaller leak from the inactive mine that was already polluting the river. This was not the first river famous for trout fishing and whitewater to be so poisoned. And, as you read on, you’ll see it’s not likely to be the last. While headlines across the country point fingers, hundreds of thousands of similar abandoned and inactive mines lie scattered across the nation. With all the attention on the problem of abandoned and inactive mines we thought we would try to map some of these other mines that haven’t made headlines (yet). 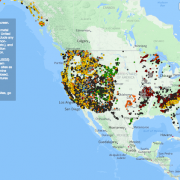 The most extensive, and most current, nationwide dataset that we could find was the U.S. Geological Survey’s (USGS) Mineral Resources Data System (MRDS), which contains information about over 266,000 sites in the United States. However, “most extensive” is a relative term. According to the Environmental Protection Agency, the United States hosts anywhere from 100,000 to 500,000 abandoned mines , while third party reports from the early 1990’s compiled from state-by-state data put the number at over 557,000. While the USGS data contains plenty of information about the type of minerals once produced by these mines, it says little-to-nothing about who is responsible for the site or the status of site reclamation. In order not to clutter the map with quarries and gravel pits, we also excluded sites that exclusively produced nonmetallic commodities. This leaves us with the 64,883 mines you see above, ranging from 200+ year old gold mines in Virginia to Cold War era uranium mines in the Four Corners region of the desert Southwest. What we should all take away from this map (besides an appreciation for the immense number of holes we’ve dug in the ground) is the alarming lack of data about the scope and scale of the abandoned and inactive mine problem. 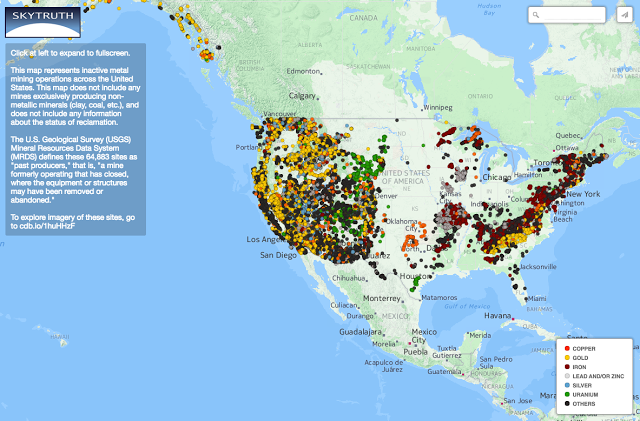 Even counting the quarries and gravel pits, the MRDS dataset only contains 118,399 records for past producers in the US, and the Office of Surface Mining’s enhanced Abandoned Mine Lands Inventory System (eAMLIS) database (not included in this map) only contains 53,794 records, mostly for coal. Even adding these two datasets together leaves us hundreds of thousands of mines short of the aforementioned estimates. More than anything, this map shows how both the public and our public officials are largely in the dark about the abandoned and inactive mine lands that litter the landscape. Furthermore, we have little information about which of these thousands of points on the map have been reclaimed, and which are toxic abscesses in the earth’s surface just waiting to poison another watershed. You can download and examine the raw data for yourself at bit.ly/usgs_mrds. Do you know of other federal datasets we should look at for information on inactive metal mines? Leave a link in the comments below.